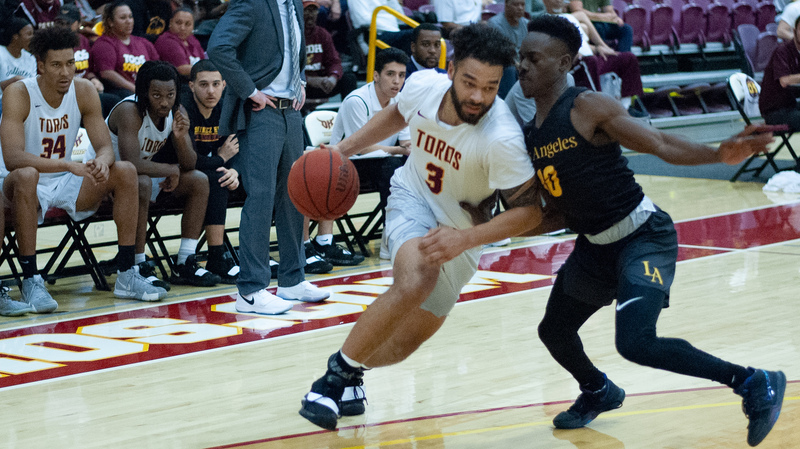 The CSUDH men’s basketball team enters the final stretch of their season in the thick of a heated playoff race, currently sitting at an overall record of 10-9 and a conference record of 8-6. Two games separate the third and eighth seeds in the California Collegiate Athletic Association, meaning it’s a wide-open race for playoff positioning. With eight games remaining, the Toros are currently in sixth place but only half a game behind fourth-place teams Humboldt State and San Francisco State, and two games behind second-place Cal State East Bay, which they play this weekend. Head coach Steve Becker said he has complete faith in his team making the playoffs. Two rookies that have stood out are guards Isaiah Morris and Alex Garcia. Morris has played in all 19 games this season, starting in 13, tied for most on the team. Garcia has also played in all 19 games, averaging a whopping 49.2 percent from behind the arc and boasts a field goal percentage of 52.7 percent. One area the Toros are looking to improve on is sharing the basketball more while limiting turnovers. They are currently averaging fewer assists (12.4) and more turnovers (15.3) than their opponents (14.2 assists and 12.7 turnovers). Eight games remain in the regular season, with four on the road and four at home. Pending matchups against the top four teams in the conference will help determine what seed the Toros will be going into the postseason. Up next: the team plays its next two games at home against last-place Cal State Monterey Bay (2-13 in conference; 2-18 overall) on Thursday, Feb. 7 at 7:30 p.m., followed by a huge game against second-place Cal State East Bay (11-4, 16-9) on Feb. 9, at 3 p.m. The Toros beat Monterey Bay earlier in the season by two points in Seaside and lost to East Bay by 13 in Hayward.